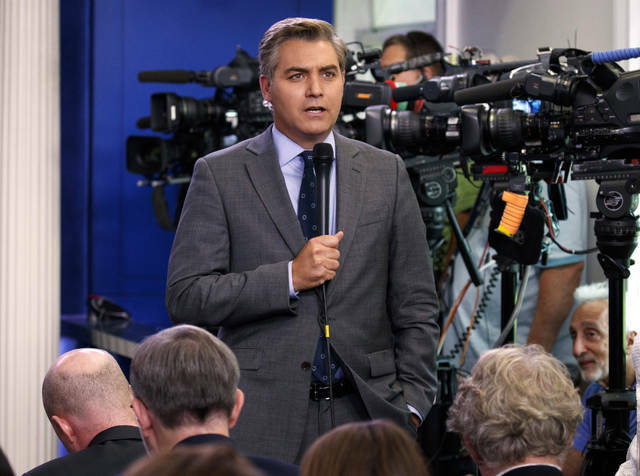 NEW YORK (AP) — President Donald Trump claimed on Friday that a White House-released video depicting contact between a staffer and a CNN reporter wasn’t altered, and he seemingly threatened to revoke the White House press credentials of more reporters. That contradicted remarks Trump made on Fox News last month, when he called Whitaker “a great guy” and said “I mean, I know Matt Whitaker. Trump elevated Whitaker to the post on Wednesday after forcing out Sessions, installing a Republican Party loyalist to oversee the special counsel investigation into possible ties between Russia and the president’s 2016 campaign. Legal scholars, meanwhile, have debated the constitutionality of Whitaker’s appointment, with some lawyers saying it is illegal because Whitaker has not been confirmed by the Senate. 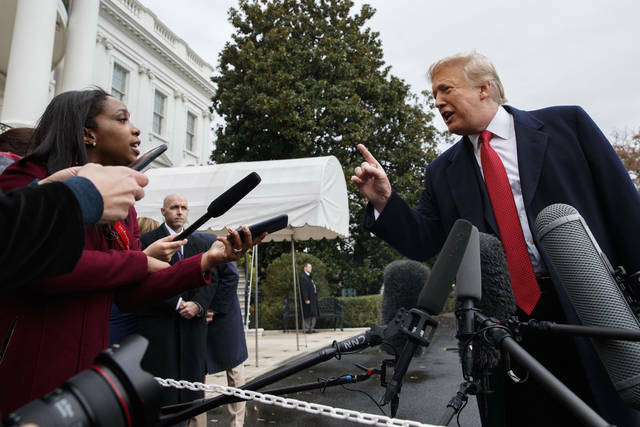 Despite Trump’s distancing himself from Whitaker, two Republicans close to the president said he had enjoyed Whitaker’s TV appearances and the two had struck a bond. Those TV appearances included one on CNN in which Whitaker suggested that the Mueller probe could be starved of resources. 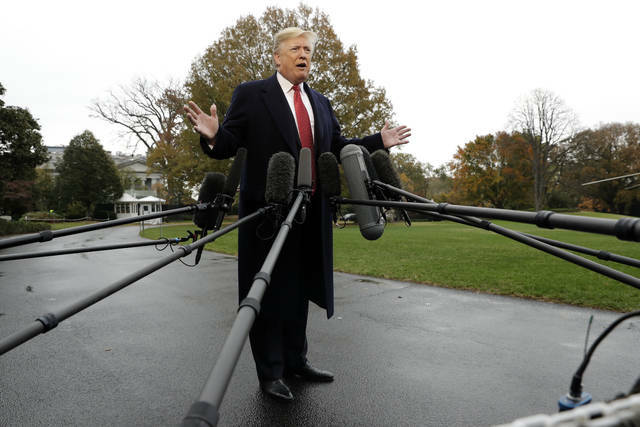 Trump told associates that he felt that Whitaker would be “loyal” and would not have recused himself from the Russia probe as Sessions had done, according to the Republicans, who were not authorized to speak publicly about private conversations. In his comments Friday, he said he had not spoken with Whitaker about Mueller’s investigation, which until now has been overseen by Deputy Attorney General Rod Rosenstein. In Kentucky, Senate Majority Leader Mitch McConnell said he expects Trump to nominate a new permanent attorney general “pretty quickly.” McConnell said he expects Whitaker to be “a very interim” attorney general. IOWA CITY, Iowa (AP) — The man who will serve at least temporarily as the nation’s top law enforcement official is a relatively inexperienced Republican Party loyalist from Iowa who has called for limiting special counsel Robert Mueller’s investigation. COLUMBUS, OH—Today, activists in Columbus—in conjunction with Indivisible groups from OH3, OH12, and OH15 Congressional districts—will join nationwide protests that support protecting Special Counsel Robert Mueller’s investigation into Russian interference of the 2016 election. The protests come in response to President Trump’s decisions to remove Jeff Sessions as Attorney General and to install Trump’s longtime ally Matthew Whitaker as Acting Attorney General. Whitaker will now oversee the Mueller investigation instead of Deputy Attorney General Rod Rosenstein. Protesters will demand that Whitaker recuse himself, given his conflicts of interest and his previous statements attacking the investigation. They will also demand that Congress act to protect the Mueller investigation. More than 2,700 people signed up to attend an event in Columbus that would support the Mueller investigation. The nationwide protests are being organized by a coalition of hundreds of public interest organizations. More information can be found at TrumpIsNotAboveTheLaw.org.